Bawah Island has just opened and is a new destination for discerning travellers. This untouched Resort has five islands and 300 hectares that feels like a world from 10,000 years ago despite being just 150 nautical miles from Singapore by private seaplane. Bawah Island is home to three crystal clear lagoons and 13 powder beaches. The islands are covered in a lush jungle canopy that is great for trekking. Bawah Island is committed to environmental and ocean conservation. There are four bars and restaurants, and dining is a Bawah Island highlight. Take lunch at beach side Boat House or at the Grouper Bar, by the pool. In the evenings, try and exotic cocktails at the Jules Verne Bar, before dining at the Treetops restaurant . The Island is in the remote Anambas Archipelago, one of Indonesia’s first marine conservation areas. 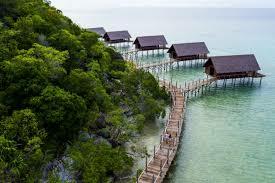 To get here you arrive via Singapore, travelling north by ferry (1hr) to the island of Batam, before hopping on a private seaplane for the 1hr 15min ride across the South China Sea. Total journey time is about three hours – or you could glide in on a private yacht. The resort has been five years in the making and the owners and architect (Singaporean designer Sim Boon Yang) have gone to great lengths to work with, rather than bulldozing through, the islands’ unique environment. Villas have been positioned around large trees; roofs are thatched with extra-large palm leaves from a neighbouring island; and the tables and chairs are fashioned from flotsam. The result is a resort that feels earthy and organic, yet cool, decadent and cosseting too.